Congratulations to debut author, Paul Greci! His novel, Surviving Bear Island was chosen for the Junior Library Guild program. 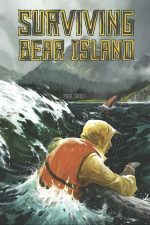 Disaster strikes while Tom and his father are kayaking in Alaska’s Prince William Sound, stranding Tom alone on a remote island with just a small emergency kit. These exciting, age-appropriate fiction and nonfiction titles will appeal to even the most reluctant middle-school readers. Move Books is proud of this recognition of our high quality books for boys. Enjoy!